India Network for Basic Income jointly with SEWA Bharat is organising a National Conference on “Basic Income in India” in New Delhi on March 29 and 30, 2017. This National Conference comes against the backdrop of dramatic new developments in India with respect to Universal Basic Income. As you are all aware, on the 31st of January 2017, a day before the Federal Budget was announced, India’s Finance Minister, Arun Jaitley, presented the Economic Survey in the Parliament. This document is a perspective document presented every year by the Ministry of Finance, as it sees how the economy has fared the previous year, and also what the prospects are the coming year. This year, this document had a full chapter on Universal Basic Income, authored by Arvind Subramanian, the Chief Economic Advisor to the Government of India. It is a 40-page document which painstakingly goes into a very balanced analysis of how the concept of UBI is relevant to the Indian context. It also lays out the challenges and dilemmas one faces when one applies it to a country as massive as India. The chapter hardly sounds like a government document. The author writes with a certain conviction that Universal Basic Income is a good idea, and that it should be seriously considered. It is our common experience that when a proposal comes from the government it kicks off a much wider debate than when a citizen’s group like us raises it. And so much better when it is articulated so eloquently, unlike normal government documents. The media was abuzz with all sorts of voices. Without going much into the contents of the innumerable articles that were written on this proposal, I would like to highlight one important aspect of this debate. Most of the commentators – economists, politicians, citizens’ groups – agree that, in principle, this is a good idea. Their disagreement them come after this point. The arguments of the opponents are not very different from those that are being putforth elsewhere in the world. . Interestingly, these voices have not been very strong in India. Interestingly, all over the world UBI has support from both the Left and the Right. In the same breath, it also has opponents from both the camps. India is no exception. In any case, the point is, within a short period, the idea has been gaining a great deal of traction in the country. As INBI Coordinator, increasingly I feel that there is now an urgent need for UBI literacy in the country. To tell people what it is about. What it implies for the citizen and for the government. Given the mind-boggling numbers and fiscal implications, one thread of the UBI argument in India is: In order to make UBI meaningful, should we start with specific demographic groups rather than all citizens? And incrementally move towards “Universal”? If yes, then what should those vulnerable groups be? The tribal population (104 million and about 9% of the population)? Or all women(about 500 million about 48%of the population)? Or the elderly (about 100 million)? Or the Scheduled Caste population(about 200 million)? UBI purists might consider this a dilution of the concept of UBI and a sell out. Be that as it may, that is where the debate is now. On International Women’s Day (2017) two associations, who otherwise make strange bedfellows, endorsed and appealed for ‘UBI for Women’. 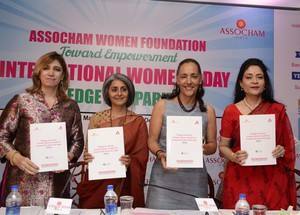 Self Employed Women’s association in Madhya Pradesh, and the oldest Industry body in Indi a, The Associated Chamber of Commerce and Industry of India (ASSOCHAM). Soon after the UBI proposal was presented in the Parliament, the Finance Minster of the northern-most state Jammu and Kashmir, Mr Haseeb Drabu, announced that the state is ready to implement a UBI. However, this readiness, he clarified, is contingent upon the federal government giving him a ‘go ahead’ because the federal grants form the substantial part of the state’s welfare budget. It is a matter of time before more state chief ministers begin to see the economic, political and the moral dividends of the policy of Universal Basic Income. In India, the electoral heat and dust never settles. Between any two general elections, we have innumerable state elections or by-elections. People’s verdict is something that continually happens in India. UBI has not yet entered the electoral discourse. The first of its kind came during the recent Uttar Pradesh elections. Varun Gandhi,a two-time BJP Member of Parliament and the first cousin of Rahul Gandhi, wrote an elaborate article offering UBI as a solution to extreme poverty in the state. Again, it is a matter of time before other politicians catch up. Well, it is against this backdrop that our National Conference on Basic Income comes at the end of this month. We have tried to get as many voices as possible that endorse and affirm the idea. Along with the major political personalities who have come out in favour of UBI, we are also going to have economists who are engaged in serious calculations and trying to grapple with fiscal and political implications of UBI. The challenge before INBI thus far has been to talk about the idea of UBI and foreground the evidence from the pilot study that UBI has positive and transformative effect on people’s lives. The challenge now is to work with all the groups and also with different state governments and the federal government to find ways of operationalising the idea. This is not an easy task. But then, that is the task before us now. Sarath Davala has written 2 articles. Important next step. Good luck with the conference. Not UBI, NEW MONEY. Not supported by taxes, not as income, but NEW MONEY to keep the GDP circulating on a need only basis, as calculated on a yearly accounting. Make every adult citizen responsible for infusing the new money into the economy. It’s winter or spring in only half the world at any given time. In the other half, it’s summer or autumn with abundant crops and harvests providing more than enough to supply nations locally and to be exported everywhere that people abide. Likewise with manufactured goods and products. Trade and technology exist in great abundance from one end of the earth to the other. WE ARE HERE. Numbers reaching into the trillions challenge socioeconomic and political thinking everywhere. Yet world leaders disregard all such abundance. Choosing borders and walls and impoverishment and war and reshuffling the tax money pie, they studiously avoid new levels of governance. All agree it’s unthinkable to add NEW MONEY freely, like sunshine, to energize economies and support expanding GDPs from the grassroots up. Never mind that money, being what it is, migrates out of circulation to become less, not more. Never mind that only federal governments print and mint NEW MONEY. Never mind that the NEW MONEY adjustment only works as maintenance during the good times. Failing recessions/depressions are still the only motivations that impel governments to interact to solve economic connundrums.